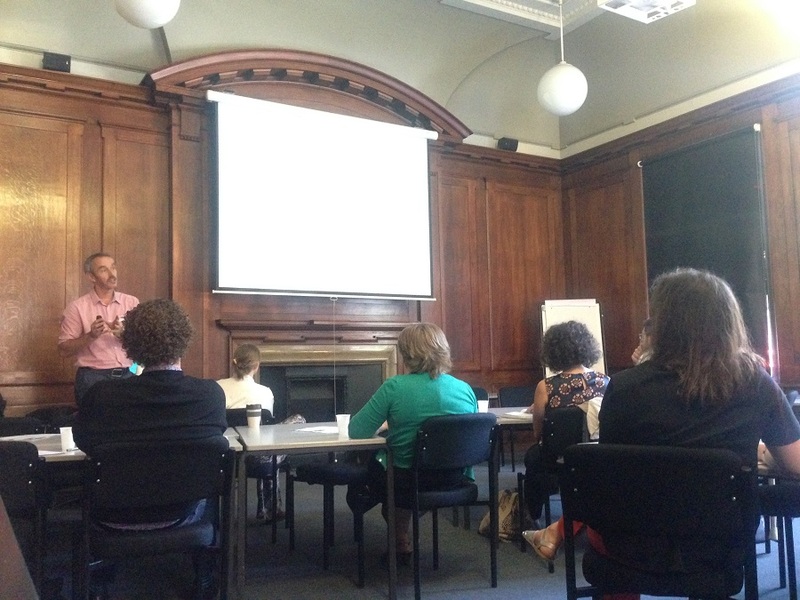 Before the start of term, the Public Engagement Team at Birkbeck hosted a one day workshop for Birkbeck academic staff so we could share our experiences of why and how we involve others in our research practices. This was a rare chance to meet colleagues from different pockets of the college to focus on research methodologies. It turns out I’m not the only one doing messy research that is made even messier by working with others at all sorts of stages of the process. A lot of the talk on public engagement in higher education seems really obvious to me. Having come from a socially engaged art and curatorial background before entering academia, working with others has been a given. We have a whole discourse, with publications, exhibitions, conferences on the ethics of socially engaged art practices, with roots going back to conceptual and feminist art histories, for example. In academia, researchers using qualitative forms of research through anthropology and ethnography have been exploring and problematising the relationships between researcher and those being researched, for decades. For this reason, I felt like I had ‘found my people’ at this workshop. Here were other researchers pushing at the boundaries of what a researcher might be, for working with others often involves challenging who does research, how it’s done and who it’s for. We seemed to bond over our experiences of falling through the gaps, in terms of funding, disciplines and methodologies. We shared the stories, histories and genealogies that have shaped our research practices. Public engagement, for many of us, isn’t about engaging the public with our finished research (this might be a process of communicating the research as a marketing or PR exercise), rather it is about engaging with people in the formation, process, analysis and/or distribution stages of researching. Bella Starling in her presentation, for example, stated how ‘knowledge is socially constructed, so it makes sense to engage people’. It turns out this way of working is still quite marginalised in many university contexts, reflected, for example, in the assumption that knowledge is produced (and owned) by individual brains rather as a relational, multi-authored practice. I’m still not convinced that the university or REF can cope with this thought, but the recent SEE-PER grant Birkbeck was awarded is encouraging. There were questions during the workshop, for example, about how we consider the public engagement we do as central to our research, as a process of producing data and evidence, rather than a side-project. There is a sliding scale of engagement (Arnstein’s ladder of participation is an obvious example of this, going from manipulation to citizen power). To engage someone / a group might mean relinquishing control and being open to the research heading in different directions or challenging the very premise of the research. Opening up research processes means dealing with more than your own agenda, assumptions and priorities. None of these positions (including the researcher’s) are neutral. Engaged research involves risks (as all research does) and can be a negative and destructive process, as one participant at the workshop put it. It can certainly be awkward and uncomfortable at times. As Kate Maclean asked in her presentation: how are researchers used by publics for their potential political/personal gains (as well as the other way around)? Are we equipped with the skills (and legal protection) to deal with these risks and manage these conflicting and clashing points of view? Where the ideas for research projects originate (and the follow-on power relations between people) seems important to this discussion. Artists and creative approaches to engaged research, for example, can often be applied tokenistically (in the form of a creative method or illustration). To develop practice-based engaged research is different and involves practice-based researchers from the outset, such as with the Waiting Times project presented by Lisa Baraitser. These issues are also reflected in the Creative Living Knowledge report on the AHRC-funded Connected Communities research. Becky Jones in her talk about the Wellcome Trust’s new strategy for public engagement suggested researchers ‘start the conversation earlier’: what are the problems, challenges, gaps in evidence, why is it important? Because we are situated and paid by a university, the research is often initiated by us and we invite others in, but are there other ways of approaching this and what are the issues with this? A research process, in my experience, involves asking difficult questions, potentially finding out things that might be hard to hear. Are all the partners and participants willing to be part of this difficult, critical process? There are pressures from all quarters (funders, partners, REF) for research to be impactful in a positive way, but what about the pitfalls, the negative aspects, the dark side of research that is messy, ugly and not what you or others expected or wanted? As a participant at the workshop said, well-intentioned public engagement is a waste of time and money. Becky Jones also gave some top tips for applying to the public engagement fund at Wellcome, such as ‘articulate the changes you want to see as a result of the engagement’. The problem with this is that if you are involving people in the process, the changes are not yours to decide from the outset, these will be generated by the process of engaged research. Engaged research is an unpredictable process. where, when does analysis take place? what are the issues with volunteerism and unpaid labour in engaged research? when and under whose terms does engagement occur? At what point on the research journey? (how) do processes of engaged research end? why was it mostly women in the room? There is a pressure for universities to be seen to be doing public engagement work. This can be done tokenistically as a top-down directive or can be integral and central to researchers who are working in this way. It seems some universities have KPIs to make sure public engagement is taking place. This seems the wrong way around. For me, it’s a methodological question informed by our epistemological and ontological positions. Engaged research shouldn’t be enforced. This workshop felt like an important step in finding out who is doing engaged research already at Birkbeck, bringing those of us together who have been practising and critically reflecting on this for years from their different inter-disciplinary perspectives. It was an important occasion for us to listen to each other and exchange experiences and quandaries. It was also important for the College management to hear more about how we can be supported and find out what barriers we face and issues we are encountering. There is a danger of marginalisation of public engagement in universities (at Birkbeck there are only three members of staff, two of whom are on short-term contracts and part-funded through external funding). The workshop flagged the need to acknowledge the time, resources and emotional labour that goes into engaged research and therefore the support it needs internally and externally. Pressures to publish, for example, can stop researchers developing embedded, engaged research. It’s extremely slow, time-consuming and resource heavy, but for many of us, it’s embedded and embodied in our research practices. This event was a chance for us to start to find our collective, critical voice as engaged research practitioners.